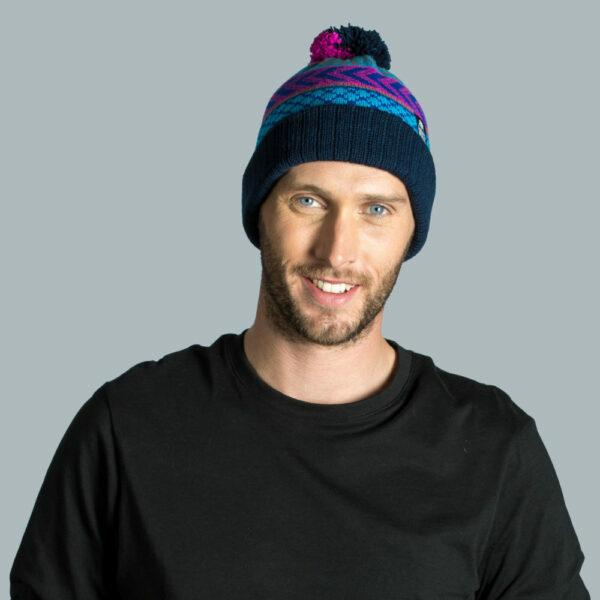 This little bobble hat is made from soft acrylic yarn and fits snug on your head. 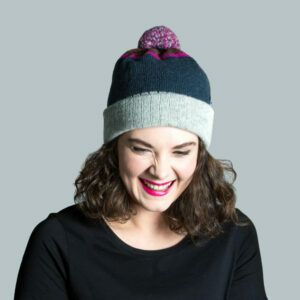 We’ve made a smaller size two tone pompom to top it off adding an additional flash of fuchsia pink colour. Our signature wonky design is a layer of three patterns including a centre bar of chevrons. 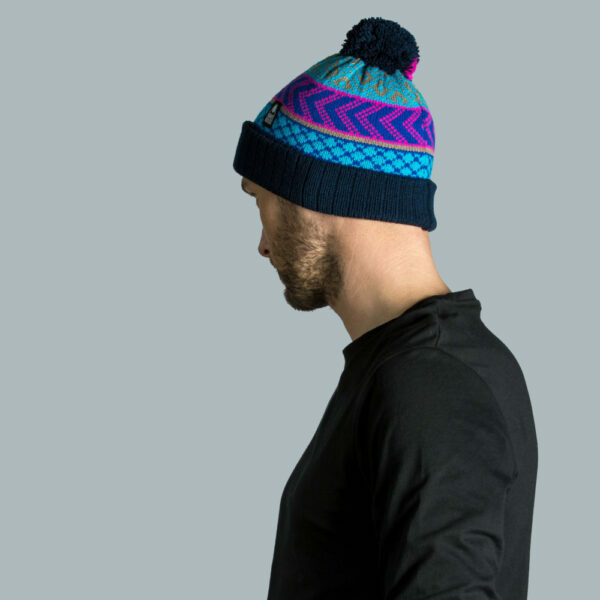 This hat uses dark navy in the roll up rib and blends koala, fuchsia pink, turquoise and royal blue together to create a vibrant combination. 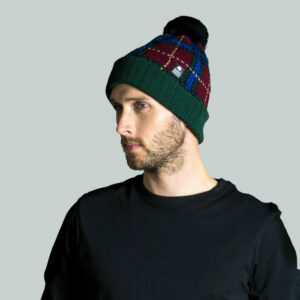 You can create a nice set by pairing this hat with a knitted band or scarf from the disco range. 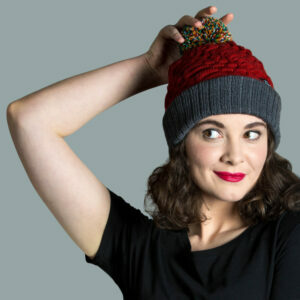 This combination of deep red and charcoal merino wool has lovely rich tones to it. 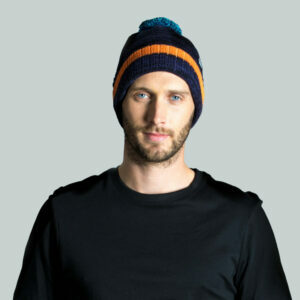 The ribbed roll up section adds an extra layer of comfort whilst allowing extra stretch. 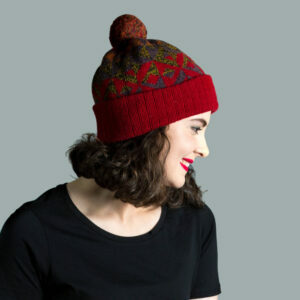 The flame design is unique as the pattern creates folded layers of wool which act as little pockets of air to hug onto your head while simultaneously adding warmth. 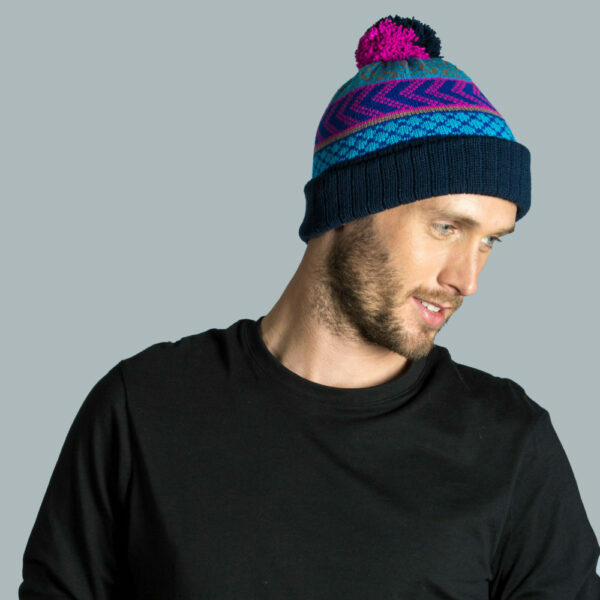 The soft pompom is a blend of 8 different colours adding a pop of colour to the top of the hat. 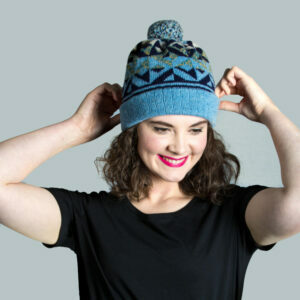 This merino wool is heavy weight so the pompom hangs on the hat in a slouchy style. 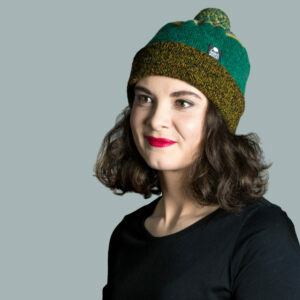 All our flame hats are knit by Maw Wonky in her country abode. 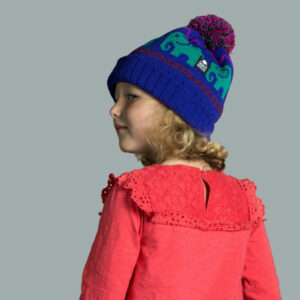 We hand finish them in the wonky workshop by stitching them together with care and attention. 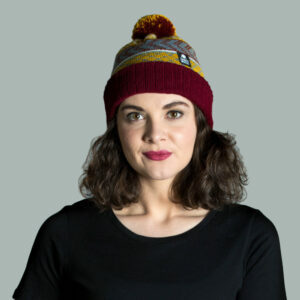 This long length wonky disco hat is designed to fit a little slouchy on your head, with the pompom weighting it down at the back. 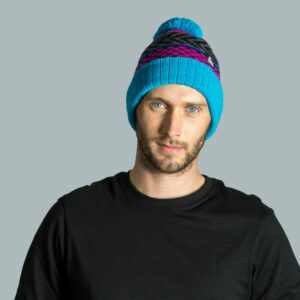 The vibrant turquoise roll-up and pompom sandwich all three pattern layers in the design. 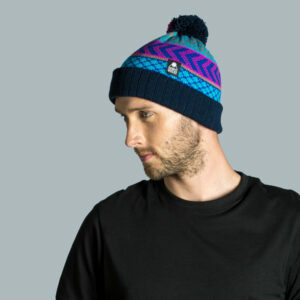 We’ve used fuchsia pink with navy in the cross-hatch design followed by a royal blue stripe, navy and koala chevrons and royal blue with fuchsia at the top. Paired here with the infinity Disco scarf, a long loop or double wrap over scarf, it creates a super cosy combination.